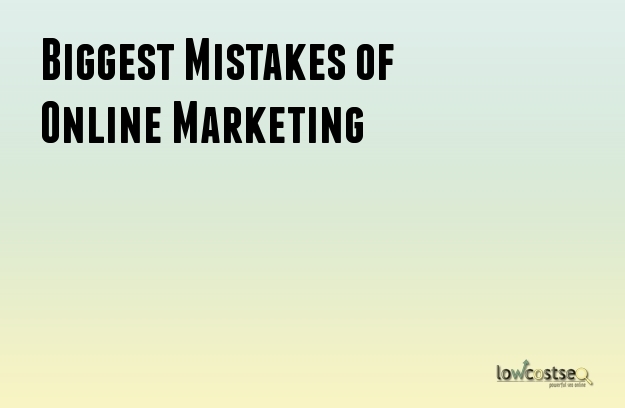 What are the Biggest Mistakes of Online Marketing? Online marketing is considered to be a very lucrative market and many people have been able to make a lot of money by using this business model. However, there are many too who have failed to make the mark. The reason behind this difference in result is a few steps and understanding of the business models. There are certain major mistakes that you need to avoid at any cost, if you want to be a successful entrepreneur in the field of online marketing. ·Lack of Audience Research: This is a fat mistake that the businesses need to avoid at any cost. Before you develop, even come up with the concept of the product, you need to make proper research regarding the audience. If you do not do it right, you can end up losing a lot of money. Even if your product is very interesting and useful, lack of audience research can lead to its downfall. The startup entrepreneurs especially, must be very careful about this as they do not have a lot of money as it is. ·Not Understanding One’s Passion: Success is any field is dependent on hard work, diligence and not to mention passion in the area. Even if you think you have done ample research on the subject and are ready to play in the field, there will be certain unforeseen influences and results that you may not see coming. During such trying times, only your passion will help you tide through the problems and take you take control of your business. The online marketplace is very competitive place and you need to have the required amount of passion and interest in it to handle the tremendous pressure associated with handling it. ·Inability of Check the Cost of Advertising: Advertising is very important if you want to give your business the due exposure. It is a very important marketing tool that ensures that the name of the brand reaches far and wide to a number of customers far and wide. There are number of online marketing techniques like search engine optimization, email marketing, articles marketing, PPC, etc. These different variants have their own costs that may escalate to an amount that is beyond what you have anticipated. If you do not control this amount at the very outset, your business may face a lot of losses. There are some useful applications like Google analytics, what will help to get a grip on the amount of expenditure and get good results. ·Lack of Adequate Focus: This is a reason behind failure in a lot of things. If you lack the concentration and focus, you will never get the results that you expect. If you think that you are not up to all the exertion associated with the online marketing process, you can take the services of a service provider and get the work done. If you are able to bring all these mistakes into control, you will be able to make your online business successful and earn a lot of profit from it.